A single piece, natural, lightweight, safe alternative to the traditional wooden or foam yoga block. 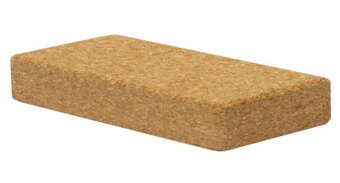 High density cork construction, with chamfered edges. Will not 'give' under weight or pressure. Great for providing extra support, lift or grounding in numerous standing and seated postures and also good for helping with shoulder stand (you would need to use 4 blocks for this). Has three distinctly different dimensions to vary support height, offering stable support in all planes. We recommend that you take guidance from your Yoga Teacher on how exactly to use this prop in a way that is appropriate to your particular yoga practice.